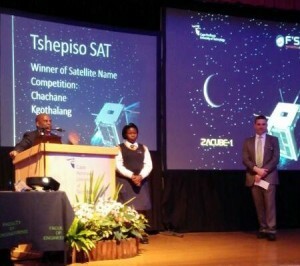 When again you hear the name “Tshepiso” or anything to do with South Africa’s first low earth orbiting satellite, let your mind wander from outer space to the Eastern Cape to remember Chachane Kgothalang of Matatiele. It’s Chachane’s choice of name that is now linked to this satellite which was launched on 21 November from the Yasny base in Russia. It was funded by the Department of Science and Technology (DST), and designed and built by postgraduate students of the Cape Peninsula University of Technology (CPUT). Work was done in collaboration with the South African National Space Agency (SANSA), following the CubeSat programme at the French South African Institute of Technology (F’SATI). Chachane, a Grade 9 learner from Bethel Junior Secondary School in Matatiele won a national competition launched by DST and managed by the South African Agency for Science and Technology Advancement (SAASTA) earlier this year. The competition called on all learners from grade 7 to 12 to become part of South Africa’s space programme by giving the cube satellite a truly African name. The competition aimed to create awareness of the cube satellite and give learners an opportunity to contribute to the space science and technology programme. She was able to attend the live streaming of the launch of the satellite in Cape Town. Chachane’s winning name, which means “a promise” in Tswana, has a much more personal ring to it than the satellite’s code name of ZACUBE-1. The nano-satellite, designated “ZA-003” in the national register of space assets, follows in the footsteps of micro-satellites Sunsat and SumbandilaSat. Tshepiso will orbit the earth at an altitude of 600 km. Its main mission is to gather data on space weather for SANSA. Space weather refers to the ever changing conditions on the Sun and in space that can affect technological systems on Earth or in space, or which could imperil human life or health. CubeSats such as Tshepiso are extremely small satellites in the form of 10 cm cubes that do not weigh more than 1 kg (although there are some made up of two or three such cubes). Originally developed in the US, they are becoming increasingly popular with universities and technology institutes around the world due to their considerable educational benefits. These tiny satellites have come a long way since Sputnik, the first satellite that was launched in 1957, weighing 83 kg. The success of the CubeSat programme has revolutionised space technology. CubeSats provide hands-on experience for engineers and technologists in their design and construction, and, once in orbit, the data needed to support scientific experiments and projects. Established in 2009, the CubeSat programme has graduated 32 master’s students, bringing to 42 the total number of F’SATI alumni at CPUT. The programme has also provided internships to 15 of the graduates as engineers-in-training.